We live in the age of computing devices and Internet where software, hardware, antivirus and data recovery are commonly used terms by most of the people. But four decades ago, people weren’t much aware of these terms and stored all their data on physical files. Since then computers have gradually replaced paper and all the data is now stored on virtual files on hard drives and other storage units. This has simplified the process of storing data but unfortunately opened new vulnerabilities. A storage device can fail and computers can crash. Hence, you can lose your important data stored on computers. Of course, you don’t need to go back to the “paper” era! There is a process that helps you restore data from failed hard disks and damaged computers. It is called “data recovery”. Deletion of Files: Files can be deleted intentionally or unintentionally. However, devices it may be PC or mobile, do not erase data immediately from its memory. It only deletes file citations in the directory system. Dedicated software or trained professional trace data and bring it back to its previous form. Hard Disk Failures: This kind of data loss can be serious and requires expert attention. Hard drives or other storage devices can crash sometimes due to reasons like manufacturer faults, heat, internal faults, corrupted files or human error. However, you may lose your data permanently in respective cases. Methods like repairing master boot record, partition table, and file system can restore data from such storage devices. System Failures: Break down of hardware, severe operating system issues or accidental deletion of vital files can lead to system failures. They usually happen to computers with single partition. Under such circumstances, different methods can be applicable according to the condition of system. One of the methods is transferring files from the previous hard disk to a new system. Virus attacks can also cause loss of data. It can infect and manipulate files and also affect the boot sector of the hard disk. Such incidents can lead to permanent loss of data from the system. Why Data Recovery Is Necessary? From national security agencies to individual houses, computing devices are used everywhere to store sensitive data. Therefore, be it organization or individual, data plays an important role in their growth. Again, making data immune against corruption, system crashes and accidental deletion is very important. Hence, it makes data recovery a necessity more than an option. 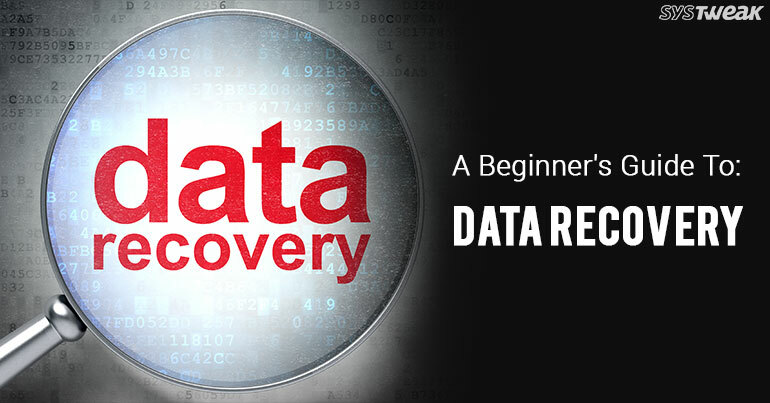 Every individual should have an appropriate recovery plan created for recovering lost data. Backup Data Online: You can backup data online using cloud backup services. You can use services like Right Backup to automatically store your device’s data online. The useful software is available for all platforms. Use Other Storage Devices: You can also save your data on external hard drives, flash drives or DVDs. The entire idea is to back up your important data before any unfortunate incidents. How alert we may be, we will face circumstances which may lead to the need of data recovery plan. As there are majorly four types of devices- Windows, Mac, Android and iOS, we are sharing with you the know-how of data recovery from respective devices. Download and install the software on your system. Click below to download. Click “Start Scan Now”. You can select ‘Quick Scan’ for quick scanning and ‘Deep Scan’ for profound scanning. Note: – If the ‘Quick Scan’ fails to trace the document, please use ‘Deep Scan’. Once scan is completed, deleted items will be listed in red font. Hence, you can choose the data from the list that you want to recover. Choose the location where you want to save your recovered files. Note: – The free version of the software only scans the hard drive. The full version costs $ 29.99. You can also recover files with the help of File history in windows 8, 8.1 and 10. Read the article to find out how. Likewise, you can recover your permanently deleted files in Mac OS as well with EaseUS Data Recovery. It is a very efficient software that thoroughly scans your Mac for deleted files and then helps you recover them with one click. Go through the user guide we made for you! Download and install the software on your Mac. Select the type of file you want to restore. Select the partition where data is lost and click on “Scan”. Select the files from the list and click “recover” to save the deleted files. There are more than 4.77 billion Android users across the world. That’s why, this guide will be incomplete without the perfect data recovery tool for Android. EaseUS MobiSaver for Android is a great software to recover data from your Android phone. It’s easy to use, efficient and most importantly ‘tried and tested’ by us. Here’s how to install the amazing software. Install the MobiSaver software on your computer and connect your Android device to your computer with the help of a USB cable. Click on “Start” to let EaseUS MobiSaver recognize your software. Once your device is connected, the software starts scanning the device’s memory to find the lost data. It will populate a list of all items in your device on your computer screen. You can view only the deleted files by toggling the “Only display deleted items” switch. Select the files that you wish to recover and click on “Recover”. We usually backup all our files on iTunes or iCloud. But accidents are unpredictable. Well, don’t worry! If you haven’t backed up your data on iCloud or iTunes. You can still recover it from your iPad/iPod/iOS with EaseUS MobiSaver for iOS. The tool has got three iOS data recovery modes for user convenience. If your iOS device is suffering from blue screen of death error, black screen, or stuck at DFU mode or ‘Apple’ logo screen, use a PC-based iOS repairing software like iCareFone or iMyFone to repair the operating system. The process will not cause any data loss. Moreover, if your device stuck at recovery mode, click “Exit Recovery mode”. Then connect the device to the computer via USB cable. Here’s how you can install EaseUS MobiSaver. Download and install EaseUS MobiSaver on your computer (Mac or Windows). Open “EaseUS MobiSaver” and choose “Recover from iOS device”. Click “Scan”. After the tool completes searching for the deleted files, it populates a list of files it found on your device on the left side of the screen. You can select categories and easily search for your files. You can preview the files from the list which makes selection easier. After choosing files, click “Recover” on the bottom left corner of the panel. It will save files on your computer. Now as you are aware about the methods- software or manual- to restore your permanently deleted files on your respective devices, use them according to your requirements. We hope that our ‘tried and tested’ methods bring back your files quickly and efficiently.